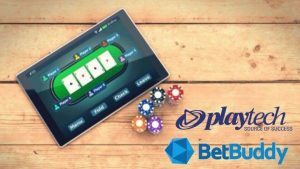 Playtech, one of the leading software developers of online casino games and software solutions, has announced it has acquired BetBuddy. BetBuddy is a leading online gambling platform that tracks potential problem gamblers. It works by tracking, recognising and modifying behavioural patterns, evaluating responsible gambling data, analytics, and develops creative solutions to identify and proactively prevent problem gambling events before they occur. The BetBuddy software uses revolutionary behavioural identification software which it has developed over the last five years with a multitude of different partners, from responsible gambling communities, educational experts through to machine learning experts. Playtech have been testing the BetBuddy analytics software throughout the year to test its function in the detection of at-risk gambling behaviour. The acquisition marks the end of a successful trial period and this software will now be fully integrated into the Playtech software. The transaction, (financial details of which remain unknown), will help Playtech better face potential future regulatory challenges against online casinos as legislative bodies look to protect online casino players from developing problem gambling behaviours. Playtech’s purchase of BetBuddy continues development of their products in accordance with responsible gambling guidelines and regulations. What does that mean for you, the online casino player? Put at its absolute simplest, the use of BetBuddy’s software integrated into that of Playtech’s is effectively is another efficient way in which online casino operators are continuing to evolve, dedicated to providing you with the safest and most secure environment in which you can gamble responsibly. Responsible gambling is fun gambling. Of course, fun being at the heart of why most of us play at online casinos. The BetBuddy platform, ‘Power Crunch’, is a next-generation responsible gambling data and behaviour analytics service. The data derived by the platform via machine learning is instantaneously fed to both operator and player. This permits the online casino provider to distinguish signs of problem gambling and therefore, intervene accordingly and respond in a scientifically measured way at the individually customised and appropriate level. Players will receive tailored communications, such as choices of actions, plus further player protection features and tools. Both rules-based and machine learning models have been tested with the goal of better understanding and spotting at-risk actions earlier than ever before. A partnership between BetBuddy and Playtech was announced back in August, aiming to work collaboratively to achieve these player protection goals. Now with the acquisition, it shows precisely how importantly Playtech value the software and concurrently, the welfare of their customers, after the successful test project period. Playtech has made it no secret that by its purchase of the responsible gambling analytics solutions firm is part of a strategy to ‘acquire complementary technology’ that will extend its ‘software and services offering’. It has announced that BetBuddy’s innovations are now set to be consolidated into its own in-house IMS system in order to deliver an ‘industry-leading responsible gambling player management platform’. Playtech gave notice that it trialled BetBuddy’s analytics software earlier this year by utilising its algorithms to detect at-risk behaviours. It has since proclaimed that the permanent integration of the BetBuddy technology into its own ‘data-driven approach’ will allow it to ‘take the next step’ in developing, deploying and curating its online casino content ‘in a sustainable manner’. For their part, BetBuddy announced that for the past five years had seen it collaborating with the clinical, responsible gambling and machine-learning scientific communities in order to develop ‘a proven track record’ in the implementation of its patent-pending solution. Since its establishment in 1999, Playtech has become one of the industry leaders in gaming software development with almost 20 years of experience in the online gambling industry. The company places great emphasis on quality and playability which in turn, is taking online casino games to an unprecedented level. Playtech’s success is largely built on the company’s strong partnership with its licensed online casinos as well as its determination to always provide nothing but the very best first-class gaming solutions for players. Their most popular games are the 243-betting line online slots. They feature a host of bonus games, free spin rounds, video animations and many extra features complete with superb graphics. In this series, you’ll find world-renowned titles such as The Matrix, Age of the Gods, Gladiator, Beach Life, Thor and the rest of their excellent Marvel Universe series online slots. Playtech casinos offer 500+ games, one of the largest selections offered by a single software provider. Playtech purely provides the games for its online partners. They don’t operate the casinos. Naturally, overall quality as in most other fields varies. Two of the very best Online Casinos that utilise the Playtech technology are William Hill Casino and Bet365 Casino. Obviously, they have one thing in common: top notch casino games. Alternatively, as Playtech is one of the top software providers worldwide for high quality online sportsbooks, William Hill offers some of the best online sports betting you’ll encounter anywhere. Both online casinos offer great sports betting options on virtually every sport you can possibly imagine. Specifically, they do an excellent job for Canadians with a full range of North American sports betting options available such as NHL, CFL, NFL, MLB and NBA.